Speaking at a thanksgiving service to mark the 60th Anniversary of the primary school, Feature Speaker Reverend George Frederick said it is important for the pupils to do so because when the pressures of âlife fall on you it is those who are sturdy will standâ. The Pastor said that there are those when the lifeâs pressures arise who will fall because they did not âmould their lives or build their character on that which is sturdyâ. He reminded the students that there are two kinds of people, the wise and the foolish. He asked them not to get caught up in vanity and the things of the world. 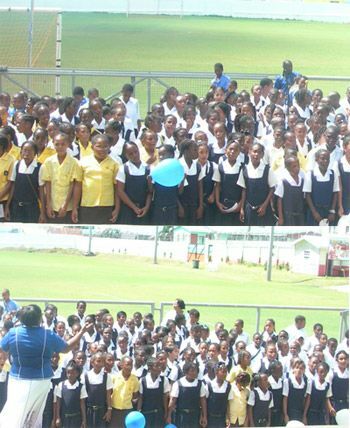 Frederickâs remarks were made at the Victoria Park, where teachers, present and past students of the institution had gathered following a march through the streets of Kingstown. In her address, Principal Morine Williams said the school can boast of being a primary school âthat offers a programme that all students of primary age would love to experienceâ. She stated that they are celebrating the willingness to set a standard for those students who will attend the institution in the future. Williams thanked those persons who laid the foundation âof quality education that is now our legacyâ. A speech was read on behalf of the Minister of Education Girlyn Miguel who congratulated the school on its 60th anniversary.